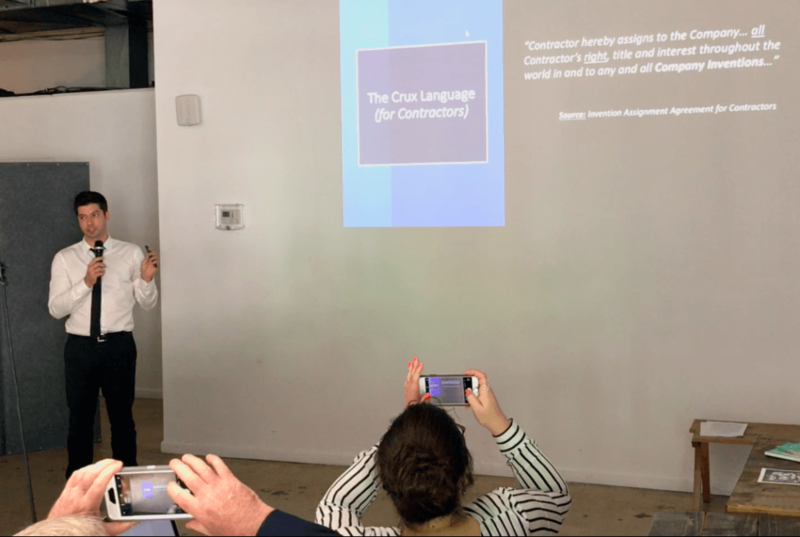 This past Thursday November 18, 2016, Peter Dzuba gave a lecture at The LAB co-working space, located in the center of Wynwood, Miami’s art district. The lecture was targeted to startup founders, educating them on what happens to intellectual property rights when they hire employees and independent contractors, and what steps they could take to change the default rules. The event was well attended, and we received very positive feedback following the event from the attendees. Indeed, great value was advanced during the presentation; not only in helping startup founders become aware of the risks associated with hiring agents without Invention Assignment Agreements in place, but also a guest appearance by Brandon Esposito helped the startup founders become aware of how securing their IP was important later on, when a VC looked at their company for investment purposes. As a summary of the information advanced in the lecture, we first covered the default rules as they pertain to Copyright, i.e. that the employer will generally own the copyright to work created by their employees, whereas they will not generally own the copyright to work created by hired independent contractors. (See the default rule at 17 U.S.C. § 201(a); the exception for “works made fore hire” at 17 U.S.C. § 201(b); the definition for “works made for hire” at 17 U.S.C. § 101; and the common law for what is an employee vs an independent contractor). We then advanced the Invention Assignment Agreement as the solution for securing the company’s intellectual property rights when hiring independent contractors (and also when hiring employees, as an additional safeguard). The content portion of the presentation was kept short in order to open the floor up to questions. The questions were excellent, and took us on a tour of all the most important issues that startups encounter in their initial stages, including: whether to incorporate in Delaware vs. Florida, the options for later converting a Florida Corporation to a Delaware Corporation, all of the contracts that a typical startup would need upon formation, how the Invention Assignment Agreement would apply in an international context, and many more. All in all, great event. Thanks to The LAB for hosting, to Brandon for his guest appearance, and to everyone who attended!